Experience a new level of hospitality at the Marriott Kansas City Overland Park Hotel deluxe accommodations and dynamic services right in the heart of Overland Park, KS. Were located just minutes from premier shopping at Towne Center, Prairie Fire and Oak Park Mall, in addition to great family fun activities such as Top Golf and iFly. An on-site Starbucks is also available to help power your mornings. Retreat to a spacious guest room featuring luxurious bedding, granite bathrooms and modern technology including interactive TVs that feature access to your Netflix and HBO Go accounts. Work up a sweat in our fitness center or cool off in our unique indoor/outdoor pool. Planning a meeting or social gathering? We offer 14,000 square feet of event space that can be customized exactly to your specific needs. At the end of the day, wind down with a cocktail and a bite to eat in our 210 Bar and Grill. Intrigued? 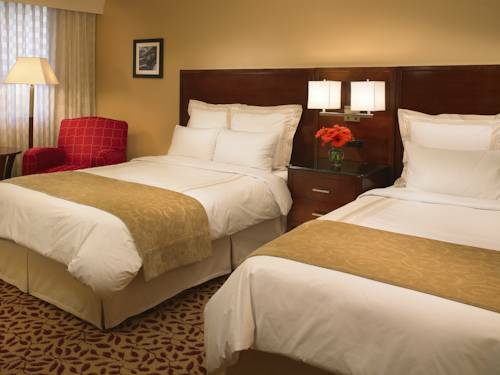 Book your next getaway or meeting today at the Marriott Kansas City Overland Park Hotel. Epicure: Start your morning off right at Epicure, our breakfast-only restaurant geared toward health-conscious travelers. Before heading out to Kansas City, stop by and try some of our modern offerings. Private dining rooms are also available for special events. 210 Bar and Grill: After a successful day of business in Overland Park, gather with colleagues for a celebratory dinner at 210 Bar and Grill. Boasting sleek d cor and a casual ambiance, our restaurant serves a delectable array of American fare and handcrafted cocktails. Starbucks : Whether you're craving your morning dose of caffeine or looking for an afternoon pick-me-up, our on-site Starbucks can satisfy your needs with our wide selection of artisan coffees, Italian-style espresso beverages, sumptuous pastries and more.